Have couple of DVD ISO images saved on your computer and want to view them on your Surface Pro 4/3/2 or Surface RT tablet? When you try to do this, you'll find it's very difficult to do the job. Well, can Surface play ISO files? Here is my answer. ISO is not one of the Microsoft Surface tablets supported formats. To get ISO files to play nicely on Surface, you have to first convert them to Surface supported video formats like MP4. In this article, you will learn how to convert ISO to Surface for playback on the go. To do this, you need a tool that can read the ISO files and convert ISO image files to Surface-friendly formats. To get all done easily and quickly, here EaseFab DVD Ripper is highly recommended. 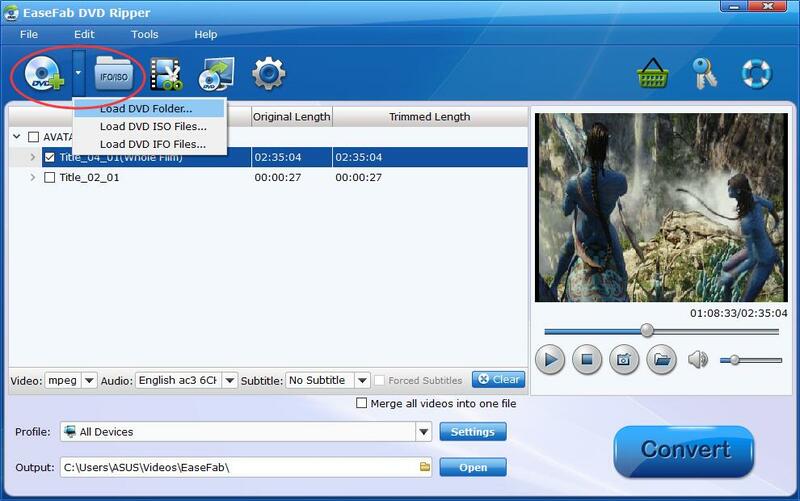 With it, you can convert DVD files including DVD discs, ISO/IFO image files, Video_TS folder, etc. to Surface compatible video format with fast speed and excellent output quality. In addition, this program can also convert DVD files to various popular video formats like AVI, MP4, WMV, MPEG, MOV, FLV, MKV, 3GP, etc. as well as rip DVD files to optimized video for playback on iPad, iPod, Apple TV, iPhone, Zune, Creative Zen, Archos, iRiver, Blackberry, Xbox 360 and more. Converting ISO to Surface tablet with EaseFab DVD Ripper is simple as ABC. After downloading, follow the wizard to install and run the program. Then follow the steps below to get the work done in a few clicks! The below guid takes DVD Ripper for Windows (Windows 10 compatible) screenshots for example. If you are a Mac user, you can turn to EaseFab DVD Ripper for Mac (macOS Mojave compatible), which has the same function as the Windows version. After downloading, install and run the ISO to Surface converter. Then IFO/ISO button to import the source ISO files to the program. Alternatively, you can click the arrow on the right of the "Load DVD" button, and then select "Load DVD ISO Files" to load ISO files. As you can see, DVD folder and IFO are also well supported. Video presets for Surface tablet are provided. You can just simply select "Surface RT/Pro/2" model as the output video format. The output videos fit Surface Pro 3, Surface RT, Surface 2, Surface Pro, Surface Pro 2 nicely. Tip: If you want, you can then click "Settings" to adjust the video parameters manually. Remember the file size and video quality is based more on bitrate than resolution which means bitrate higher results in big file size, and lower visible quality loss. According to my experience, to watch videos on Surface tablet (no matter Surface Pro 4, Pro 3, Pro 2 or the original Pro or Surface RT tablet), 720p with 2000-3000kbps is just all right. Now you've come to the last step: click the Convert button to let the program star the ISO to Surface conversion. It may take a while for the whole conversion process. When it completes, the program will notice you and you can then find the converted Surface compatible files in the destination folder. After that, you can transfer them to your Surface tablet for watching on the go with ease.